The third excavation of the first pit of the Terracotta Warriors and Horses has been continuing for 3 years. The latest news was that, there are the burned traces on these terracotta warriors in the ruins. 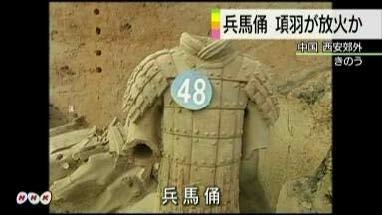 Some experts have pointed out and commented that this could possibly be the work of Xiang Yu, a general who destroyed the Qin Dynasty. In the cultural properties released to the public for the first time on 9th June 2012, it was reported by local media that these are the burned traces on the terracotta warriors. Xiang Yu (232-202 B.C.) was an uprising leader in ancient China and the King of Western Chu. He was ambitious and as a child, his uncle Xiang Liang started to hire teachers to teach him calligraphy, but he just got tired of it. After that, his uncle changed plans and started to teach him martial arts. What made his uncle disappointed was that he quitted again. Xiang Yu just said "Learning writing just helps to memorize names, while learning the martial arts serve to resist a hundred by one. I have a bigger plan, if I can choose; I would learn to fight with ten thousand people." His uncle was shocked by his words and started to teach him tactics. In 209 B.C. Chen Sheng and Wu Guang launched the peasant uprising in Daze County; along with his uncle Xiang Liang assisted the uprising. It was said that in the battle he himself killed a hundred enemies. Due to his excellent martial skills, soon he was chosen as the leader of the uprising and it was Xiang Yu who put an end to the Qin reign. Therefore, the experts focus their attention on Xiang Yu, that it was him who once set fire to the warriors. It could most possibly be Xiang Yu's work. Actually, except this case, he also had the suspicion to set a fire to 阿房宫 (ē páng gōng). The Terracotta Warriors and Horses of Qin Shihuang is located in an outskirt of Xi’an, Shanxi Province. It was in the 3rd century B.C. the emperor of the first united county (Qin)’s of Qin Shihuang, ordered to build his tomb. This tomb buried a large number of life-sized warriors and horses as his sacrificial objects. The site has been recruited in the UNESCO World Heritage List. Now, it is renowned as the “Eighth Wonder of the World”. The new excavation discovery provided the evidence for history, but there was no direct evidence that it was Xiang Yu set a fire to the warriors. According to history books, in 206 B.C. Xiang Yu had dug emperor of Qin Shihuang's Tomb. Whether it was him who set the fire to warriors and horses is not clear. Besides, there is no direct evidence between the 阿房宫 (ē páng gōng) case and the burning terracotta warriors case. If the experts hastily point out the suspect, then Xiang Yu may be unjustly blamed. The new excavation discovery has no doubt created a new media interest in the terracotta warriors again. This discovery has promoted the local culture and tourist industry. Chinese people are proud of their great culture and no doubt this discovery is a stroke of wealth for the Chinese people. In the future, with the help of technology, the Chinese may can represent what happened in Qin dynasty, by these terracotta warriors. Since the museum opened to public in 1979, the Museum of the Terracotta and Horses of Qin Shihuang has attracted more than 60 million tourists throughout the whole world. The new discovery of the first pit no doubt will arise new appealing to tourists from all corners of the world. Have a virtual experience at the Official website for the Museum of The Terracotta Warriors online or book a tour to look it yourself!